Heron, Annie Eileen. November 7th, 2018. Peacefully. Formerly of Laurelbank Avenue, Newtownards. Dearly loved wife of the late James Carser Heron and much loved mother of Sandra and David. Service in Regent Street Presbyterian Church on Monday at 10.00a.m. Funeral afterwards to Movilla Cemetery. Family flowers only please. 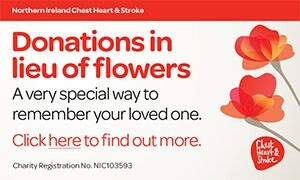 Donations may be sent if desired to Alzheimer’s Society c/o S. Clarke & Son Funeral Directors, 12 Court Square, Newtownards, BT23 7NY. I am sorry to tell you that Annie Eileen Heron has passed away.